Nidal Hasan, charged with killing 13 people and wounding 31 in a November 2009 shooting spree at Fort Hood, Texas, is pictured in an undated Bell County Sheriff's Office photograph. 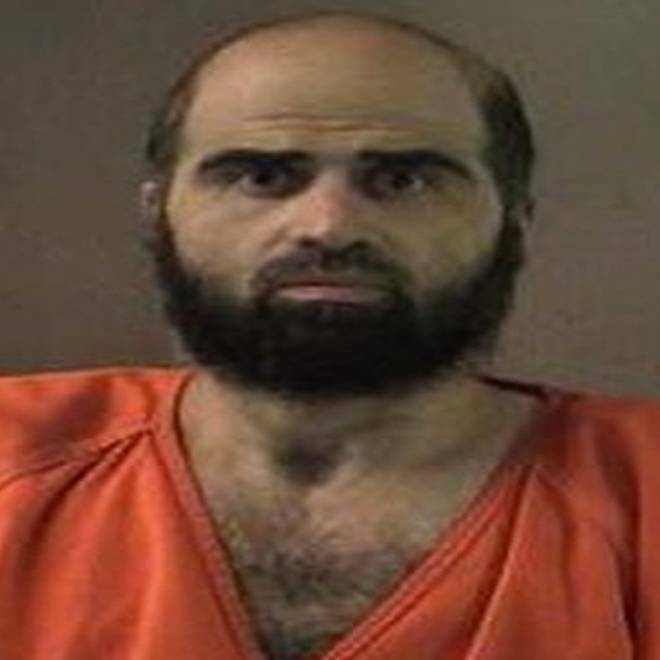 SAN ANTONIO — A U.S. military judge ruled on Monday that accused Fort Hood gunman Major Nidal Hasan can act as his own defense lawyer for his upcoming court-martial, in which he is accused of 13 murders and could face the death penalty. Trial judge Colonel Tara Osborn found the 42-year-old Army psychiatrist physically and mentally capable of defending himself in an upcoming trial, according to a statement released by the Fort Hood Public Affairs office. Hasan faces 13 counts of first-degree murder for a shooting rampage at Fort Hood in November 2009 that also wounded more than 30 people, mostly U.S. military personnel. Civilian police officers shot Hasan four times, paralyzing him from the chest down. The selection of a panel of officers for Hasan's jury was expected to begin on Wednesday, and opening arguments were scheduled for July 1. Osborn previously said she believed Hasan had the mental capacity to run his own defense, but his physical condition was an issue. Defense lawyers previously said Hasan was capable of sitting in court a maximum of five hours a day. A 1975 U.S. Supreme Court ruling guarantees the right of a defendant to self-representation, but military law experts say there are exceptions, including whether the defendant is physically or mentally capable of doing so. Hasan could be ordered to stand down if he attempts to use his trial as a stage for promoting radical beliefs, said retired Army Lieutenant Colonel Geoffrey Corn, a professor at South Texas College of Law in Houston. The FBI says Hasan exchanged e-mails with the now-dead militant Muslim cleric Anwar al-Awlaki on topics such as whether it was acceptable for Muslims to kill innocent people in a suicide attack. "Does he want to use the opportunity to represent himself as a platform?" Corn asked. "Or does he just want to play the martyr and just sit there and do nothing? We don't know." The judge on Monday ordered Hasan's current defense lawyers to stay on the team as standby lawyers, according to Fort Hood.